What does Custom Wear hub do? We print customized shirts at sporting events across the nation. HOw much does it cost for CUSTOM WEAR HUB to attend your event? Absolutely FREE! We pay your organization a percentage for hosting us. How do we turn the event logo in to our art work design? What are the options for the logo colors? Most tournament logos are 3 to 4 colors. The maximum that we could provide are up to 8 colors. Our artists are always happy to discuss your needs and suggest ideas. Does CUSTOM WEAR HUB attend indoor and/or outdooR EVENTS? Yes, we accommodate all indoor and outdoor events. How much space do we require at the event? We would prefer space at about 2 – 3 banquet size tables, but are always flexible with whatever space is provided. An outlet is required at our workspace for proper operation. What are the shirts sizes we offer? We provide many sizes, from youth small to 3XL. What is the quality of the shirts? CUSTOM WEAR HUB offers only the best quality product available. All of our t-shirts are 6.1oz. and 100% cotton, pre-shrunk. How long does it take to customize a shirt? Our process is quick, taking about only 2-3 minutes to complete one garment. What is the percentage that your organization receives after the event? Send us your tournament information and we are happy to put together a proposal for you. The payment depends on the amount of participants, the size & type of the event and the length of the contract. Can I still order a shirt after the event? Yes, contact us at info@customwearhub.com and we will be happy to help you. What kind of printing do you use? Screen printing is one of the methods we use for printing your designs onto our shirts. Screen printing is the same basic process as using a stencil, except instead of coloring in the parts of a stencil bit by bit, the entire image is prepared and pressed onto the shirt at once. We excel in a wide range of techniques including plastisol, waterbase, discharge, glow in the dark, color changing, metallic, gel, puff, reflective, high density, foil and more. Heat Printing, also known as heat transfer printing, is the process of transferring heat-applied materials to various items using a heat press. Other factors such as personalization or special requests also affect cost. To complete orders we need about 3 days (shipping time not included) from when approved artwork and payment has been received. If you need custom artwork created, please allow us more time. Any delays in the final design approval will delay your order. What kinds of garments can you print on? We print on Gildan Ultra Cotton (6.1 oz. 100% pre-shrunk cotton) but we can get any name brand of your choice. Check out our Catalogs. Do you have a minimum shirt order? We have a 5 piece minimum for Screen Printing. There is no minimum order for Heat Printing. How TO SUBMIT AN ARTWORK? You can email it to us or use the Place an Order form to upload your files. Worried it won't print correctly? Fear not! Our team of expert artists will automatically recreate and clean up all uploaded images to make sure that they print perfectly. You can email it to us or use the Place an Order form to upload your files. Just ask any other questions about sending art and we will be more than happy to work with you and your design. Can I supply my own blank garments or fabric for printing? No. We source our own garments from pre-qualified suppliers. We work with dozens of wholesale distributors and garment manufacturers. What is your maximum print size for screen printing? Our maximum image size is 16"W x 18"H. We can print pretty much anywhere on the garments that you want as long as it fits within our maximum print size. We typically do not print over a seam unless it's a hooded sweatshirt. BANKSII can match your logo/artwork color(s) to a Pantone color(s) that will contrast well with your product color. Our Expert will take the time to go over your design and help you choose the best color for your needs. We always select the closest ink match to the art you have submitted. Can you make Team Names and Numbers? Yes. Standard font for personalized names and numbers is "Varsity”. You can order different names and/or numbers to be printed on each one of your garments. The personalization portion of your design may have a different material and color than the rest of your design. How to Determine Your T-Shirt Size? 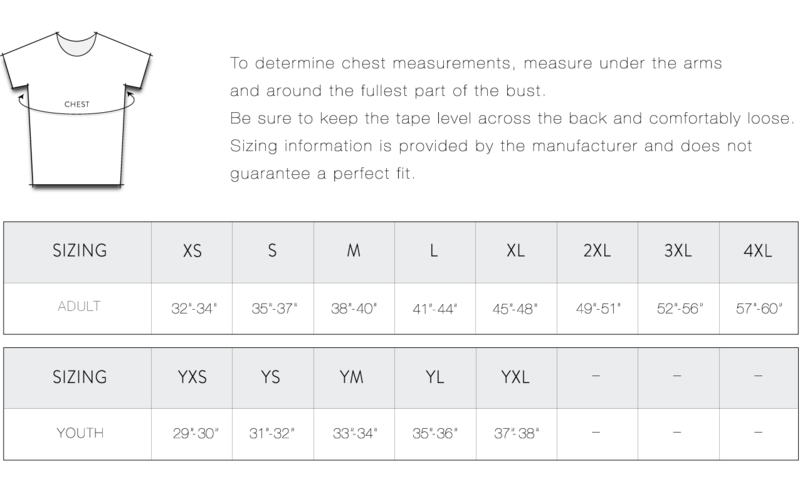 To find your correct size, simply take your measurements as shown in the diagram and use the tables below as a guide. These measurements refer to your body’s size – clothing measurements will vary due to style and desired fit, but have been designed to fit the body size indicated on the chart. We accept cash, check, money order, paypal or any major credit and debit card. BANKSII offers three different shipping options through UPS and USPS. For local clients, you may pick up or we can have it delivered via courier (local same-day deliveries) anywhere in the Seattle region. Our standard ground shipping is FREE. We also offer Rush delivery, which guarantees delivery within 5 days, and Super-Rush delivery, which would have your order at your door in 1-2 days. These shipping times reflect shipment within the contiguous 48 United States.Orders shipped to Hawaii, Alaska, and all other locations outside of the continental US are subject to additional shipping costs and may take longer to ship. ■ Super Rush delivery (within 1-2 business days) – Price based on weight, number of packages, destination, level of insurance and shipping priority. Unfortunately, after payment of your invoice we are unable to provide a refund as each design is custom-made and we produce the designs as quickly as possible to expedite delivery of our products.